In Argentina, National Flag Day is a public holiday celebrated on June 20. It commemorates the anniversary of the death of Manuel Belgrano who created the national flag of Argentina. The national flag of Argentina is a triband with horizontal bands colored light blue, white, and light blue and a yellow Sun of May (national emblem of Argentina) located in the center. The triband was designed by Manuel Belgrano, one of the leaders of the Argentine independence movement. The flag was first raised in Rosario during the Argentine War of Independence. It happened on February 27, 1812. The Congress of Tucumán officially declared the triband as the national flag in 1816. The Sun of May was added in 1818. 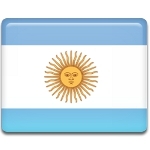 Civil flag and ensign of Argentina do not have a Sun of May. Manuel Belgrano died on June 20, 1820. More than a century later, President Roberto María Ortiz declared his death anniversary the Day of the National Flag. The holiday was first observed in 1938. For some time, it had been celebrated on the third Monday in June, but commemoration on a fixed day was eventually restored. The main celebration is held at the National Flag Memorial in the city of Rosario. It includes a public meeting, solemn speeches and a parade. Similar celebrations are held in other cities throughout the country.